Stage and screen actor Robert Alda (b. New York, NY, 26 February 1914; d. Los Angeles, CA, 3 May 1986) is best remembered for his films Rhapsody in Blue (1945) and Imitation of Life (1959), and for his Tony Award®-winning performance as Sky Masterson in Guys and Dolls on Broadway in 1950. An Italian-American, Alda had a successful career in Italian cinema as well. Born Alfonso Giuseppe Giovanni Roberto D’Abruzzo to parents Frances and Anthony D’Abruzzo, Alda (his new surname was a composite of the first two letters of his first and last given names) grew up in the heart of New York City and graduated from the prestigious Stuyvesant High School in 1930. He had his sights set on show business from the start, but his parents were opposed and pressured him to pursue other paths; thus he worked as a draftsman for an architectural firm while taking night courses in architecture at New York University. When he entered and won a talent contest, however, his architectural ambitions vaporized and he went into vaudeville as a singer and dancer. By 1934 he was well established in burlesque and as a radio entertainer. Alda made a splash with his film debut as George Gershwin in the biopic Rhapsody in Blue, but thereafter his American film career fizzled – he was better playing second leads and villains. The singing role of Sky Masterson in Guys and Dolls on Broadway was a perfect fit and brought him the Tony Award® for Best Actor in a Musical in 1951. 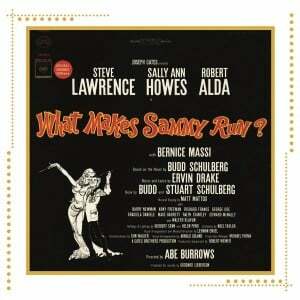 Later Broadway appearances were in the plays Harbor Lights (1956, a flop), My Daughter, Your Son (1969), and The Front Page (revival, 1969) and the 1964 hit musical with Steve Lawrence and Sally Ann Howes, What Makes Sammy Run? In 1960 Alda moved his base to Rome, Italy, where for two decades – with intermittent trips back to the States (for his Broadway appearances and to make The Girl Who Knew Too Much, 1969) – he was a familiar presence in European “sword and sandal” movies. Alda’s first wife, mother of his famous son, actor Alan Alda, was Joan Brown, a former Miss New York. She suffered from a mental illness, and young Alan spent much of his childhood tagging along with his dad’s touring burlesque troupe. In time the couple was divorced, and Robert, when he moved to Italy, married Italian actress Flora Marino. Their son Antony, also an actor, died in 2009. Robert Alda died of stroke at the age of 72.